What started out as an investigation into a dog-biting incident in Bellevue last month turned into a marijuana bust after the keepers of the animals allegedly refused to cooperate with police. 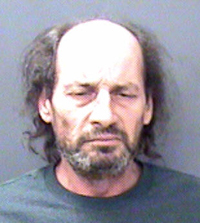 Fifty-two-year-old Douglas C. Rhoades is now charged with felony possession of marijuana. His alleged stash of 3.6 ounces of pot was discovered when investigators from the Blaine County Sheriff's Office were executing a search warrant to determine if the two dogs allegedly involved had been vaccinated for rabies. Rhoades is currently free on $10,000 bond and is scheduled for an initial court appearance on Monday in Blaine County Magistrate Court. He has hired Hailey attorney Douglas Werth to represent him. The Sheriff's Office reported Thursday that Bonnie Nichols, 48, the owner of the animals, has been issued misdemeanor citations alleging "dog nuisance." Sheriff's Capt. Ed Fuller said it ultimately turned out that both of the dogs had been vaccinated for rabies and neither had the disease. Fuller said the case started Oct. 10 when a young girl and her father were bitten by two dogs "running at large" in Bellevue. The animals were later found at a residence on North Seventh Street. Fuller said Rhoades and Nichols live at the home and were "uncooperative and obstructive" when investigators were trying to determine ownership of the animals and whether they had been vaccinated. Concerned with the health of the dog-bite victims, Fuller said investigators discussed the situation with the Blaine County Prosecuting Attorney's Office and a search warrant was obtained. Police arrived in force at the home of Rhoades and Nichols on the morning of Oct. 19. "We used several officers to deal with it because he had threatened us before," Fuller said. "We went in with the assumption that we could be met with violence because of past history with the guy." The search is described in a probable-cause affidavit filed by sheriff's Detective Mark Dalton, who reported that no one was home but police conducted the search anyway. "After knocking several times with no answer, the front door was breached and officers made entry to clear and secure the residence," Dalton wrote. In addition to Dalton, officers involved in the search are identified in the affidavit as Lt. Curtis Miller, Detective Chris Burks, Bellevue Marshal Brian Carpita and Animal Control Officer Paul Ramm. Dalton wrote that police were looking for evidence to establish ownership of the dogs and for evidence of rabies vaccinations. In the course of the search, Dalton wrote that the marijuana was discovered in a nightstand in the master bedroom. Officers confiscated the marijuana, along with various pipes, scales and other items deemed as drug paraphernalia, the report says. Rhoades was arrested the following day. He has also been charged with misdemeanor possession of drug paraphernalia. Dalton wrote that the marijuana weighed 3.6 ounces. In Idaho, possession of marijuana in excess of 3 ounces is a felony. Possession of less than 3 ounces is a misdemeanor. One of the dogs is described in the affidavit as a Chow named "Lucky."